Get Lucky This St. Paddy’s Day! 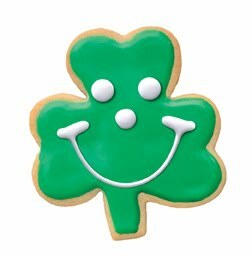 With Shamrock Smiley Cookies, of course! What did you think we meant?? Enjoy a little luck o’ the Irish with a dozen Shamrock Smiley Cookies. No one can resist their sugary green goodness – in fact, they’re sure to put a smile on the face of even the grumpiest of leprechauns. Speaking of green goodness, have you tried our St. Patty’s Day Milkshake? Premium vanilla ice cream with a blast of mint, this shake almost as good as finding a pot o' gold! And guess what? Another green favorite is BACK! That’s right, our Pistachio Pie has returned, and it’s only $8.99 for a whole pie. Or enjoy a sweet slice of deliciousness for just $1.99. Finally, if you don’t send a little Shamrock love to friends and family, they’re sure to be green with envy. So visit our online store at SmileyCookie.com and send a St. Paddy’s day gift basket anywhere from here to the end of the rainbow (well, anywhere in the U.S.)! Use code “ENP10” to take 10% off your order, now through March 17. Excludes gift cards. Click here to shop now! Seafood for Two at Eat’n Park!